92 MMS September 2017 mmsonline.com BENCHMARKING YOUR MACHINING BUSINESS END MARKETS SERVED WEBSITE lsa-mfg.com COMPANY DESCRIPTION WORKPIECE MATERIALS COMMONLY MACHINED Land Sea Air Manufacturing 861 Baltimore Blvd. 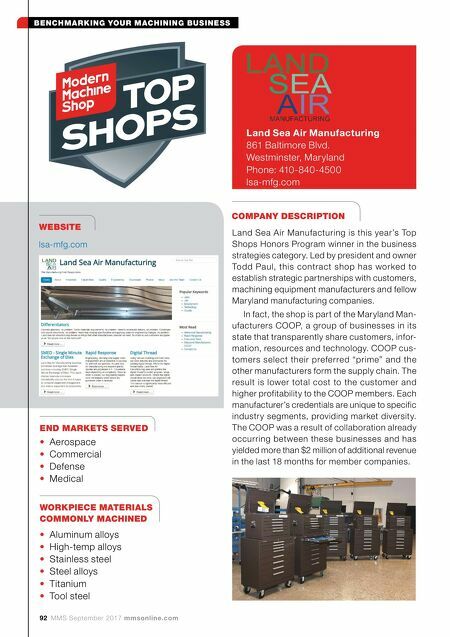 Westminster, Maryland Phone: 410-840-4500 lsa-mfg.com • Aerospace • Commercial • Defense • Medical • Aluminum alloys • High-temp alloys • Stainless steel • Steel alloys • Titanium • Tool steel Land Sea Air Manufacturing is this year's Top Shops Honors Program winner in the business strategies category. 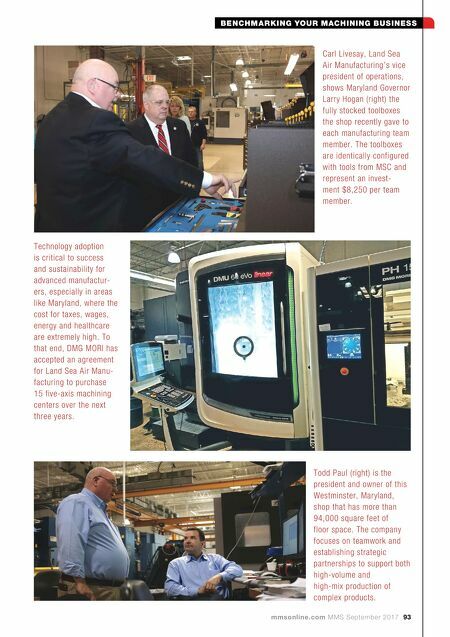 Led by president and owner Todd Paul, this contract shop has worked to establish strategic partnerships with customers, machining equipment manufacturers and fellow Maryland manufacturing companies. In fact, the shop is part of the Maryland Man- ufacturers COOP, a group of businesses in its state that transparently share customers, infor- mation, resources and technology. COOP cus- tomers select their preferred "prime" and the other manufacturers form the supply chain. The result is lower total cost to the customer and higher profitability to the COOP members. Each manufacturer's credentials are unique to specific industry segments, providing market diversity. The COOP was a result of collaboration already occurring between these businesses and has yielded more than $2 million of additional revenue in the last 18 months for member companies.